SPERI co-hosted a very successful roundtable discussion event in London yesterday with the Institute for Public Policy Research (IPPR). The event – ‘The British Growth Model: Building a Sustainable Future’- was held at IPPR’s central London office and brought together leading thinkers, academics, and journalists to debate the development, and challenge of developing, a new model of economic growth. 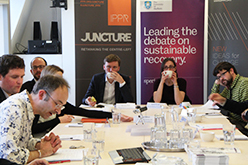 The event, which was the second roundtable discussion we have organised in collaboration with IPPR (see details of the first event here), was the culmination of a two-year research project led by Dr Craig Berry, Deputy Director of SPERI. Craig’s project has focused on the development of an alternative model for economic growth in Britain, following the apparent failure since 2008 of the Anglo-liberal growth strategy. At the event Craig presented his forthcoming paper ‘The disoriented left? Growth model failure and the nascent politics of a transformativenarrative’ before we heard responses from Larry Elliott, The Guardian’s Economics Editor, and Catherine Colebrook, Senior Economist at IPPR. Bill Esterton MP, Shadow Minister for Small Business, also joined us to respond to Craig’s paper. The discussion was chaired by Professor Colin Hay, SPERI’s Co-Director, and we were joined by prominent economists, journalists and academics, including Richard Murphy, Dr Daniela Gabor and Mary Riddell, and representatives from influential thinktanks including Torsten Bell (Resolution Foundation), Rachel Laurence (New Economics Foundation) and Stian Westlake (NESTA), as well as members of SPERI’s International Advisory Board including Dan Corry and Ann Pettifor and thinkers from the Social Market Foundation, High Pay Centre and the Royal Society of Arts. You can read a working draft of Craig’s paper in full here. In January 2016 we will publish the paper as a SPERI paper along with a number of response pieces from people who have taken part in the two seminars.